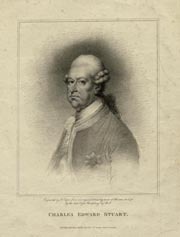 This engraving of Charles Edward, not published until the early nineteenth century, is from a drawing made by the miniaturist Ozias Humphry RA (1742-1810) at Florence in the year 1776. This was a time of regret and decline for Charles Edward and the House of Stuart. By the 1730s Jacobitism was in decline, and the 1745 Rising was the last serious political and military challenge to the Union. The timing of this revolt took everyone, including most Jacobites, by surprise. The capture of Edinburgh in September 1745 by a small Jacobite army led by Charles Edward Stuart, son of the 'Old Pretender', James VIII & III, was followed by a proclamation that promised to revisit the issue of the Anglo-Scottish Union. After an unsuccessful invasion of England, when they reached as far south as Derby, the Jacobites retreated back into the Highlands in the early months of 1746. 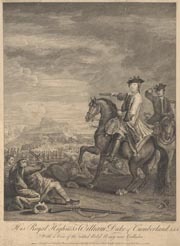 The British state finally secured its existence when an army, under William Augustus, the duke of Cumberland, defeated the Jacobite forces at Culloden on 16 April 1746.